When you contact Avast Support with a technical or malware-related issue, you may be asked to upload specific files from your PC to the Avast FTP server for further analysis. 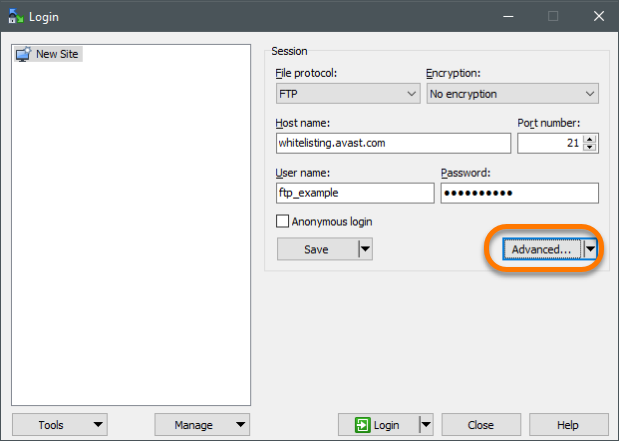 The Avast FTP server can also be used to submit files to the Avast Threat Labs for whitelisting. Fill out the Whitelisting Program Application form, then upload your files as described below. 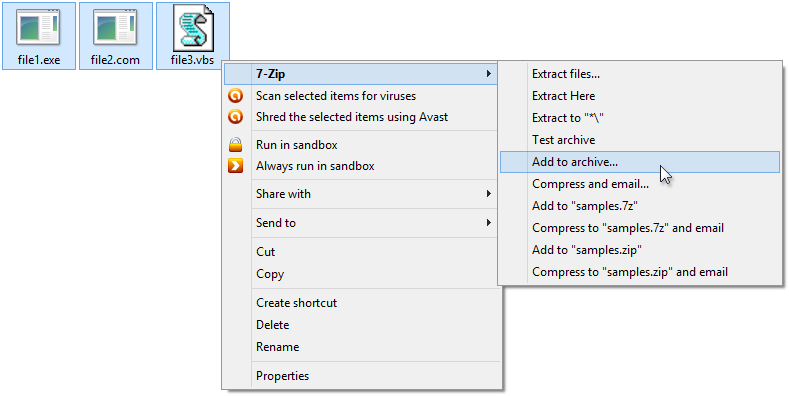 Before you upload a requested file to the Avast FTP server, compress the file to an archive (for example, a .zip, .rar, or .7z file) using the password virus. Download and run the installer for 7-Zip from www.7-zip.org to install the free file archiver on your PC. Select and right-click all requested files and, from the context menu, select 7-Zip ▸ Add to archive. Under the heading Archive, provide a unique filename, such as your email address, to identify your archive on our FTP server. Under the heading Encryption, provide the password virus. Click OK to create the compressed archive. The newly compressed archive is located in the same folder as the original files. If you are unable to compress a file flagged as suspicious by Avast Antivirus, temporarily disable Avast active protection by right-clicking the Avast icon in your system tray and selecting Avast shields control ▸ Disable for 10 minutes. Only upload files that have been requested by Support representatives. Notify us when you upload files to the server. You cannot see any content on the server, even files you upload. Download and run the installer for WinSCP from www.winscp.net to install this free FTP client software on your PC (keep the setup defaults while installing). Double-click the WinSCP icon on your desktop to run the FTP client. 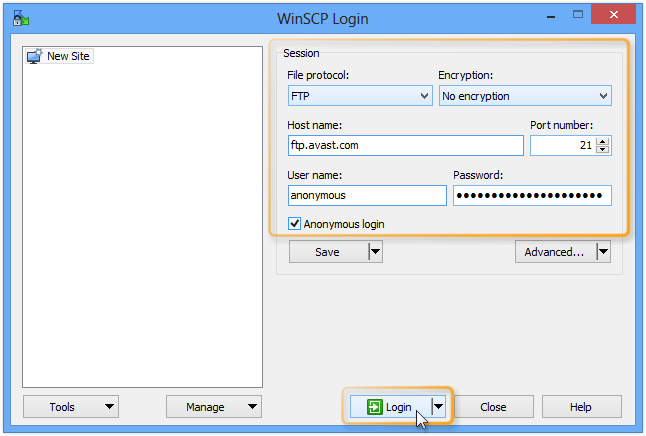 On the WinSCP Login screen, change File protocol to FTP, provide the credentials from the table above, and click Login to connect to the Avast FTP server. When a connection to the Avast FTP server is established, double-click the incoming folder on the right side of the WinSCP screen. 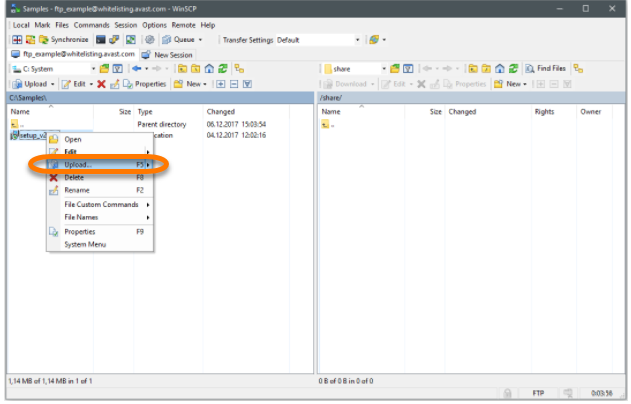 Locate the archive with the requested files on the left side of the WinSCP screen, right-click it, and select Upload... from the context menu. Click OK to upload the archive to the incoming folder on the Avast FTP server. After uploading an archive to the Avast FTP server, ensure that you notify Avast Support of the filename and password for the archive. Without this notification, we may be unable to locate your archive on our FTP server and analyze your files. Under the heading Archive, provide your preferred archive name to identify it on our FTP server. Under the heading Encryption, do not enter any password. Only upload files to our FTP server that should be whitelisted. On the WinSCP Login screen, change File protocol to FTP and provide your credentials. Then click Advanced. Select Directories from the menu on the left. 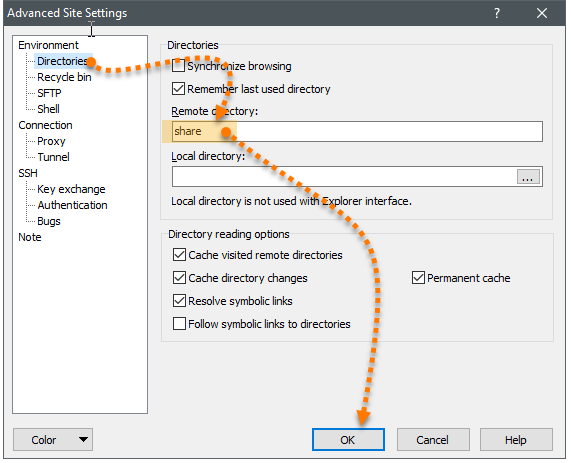 In the Remote directory field, type share and click OK.
Click Login to connect to the Avast FTP server. Locate the files to be whitelisted on the left side of the WinSCP screen, right-click it, and select Upload... from the context menu. Click OK to upload the archive to the share folder on the Avast FTP server. Avast Threat Labs will be notified automatically after you upload your file. Uploaded files will be processed within 24 hours after uploading. You will not be notified about the whitelisting process, however you can update virus definitions and scan your file to check if it has been added.